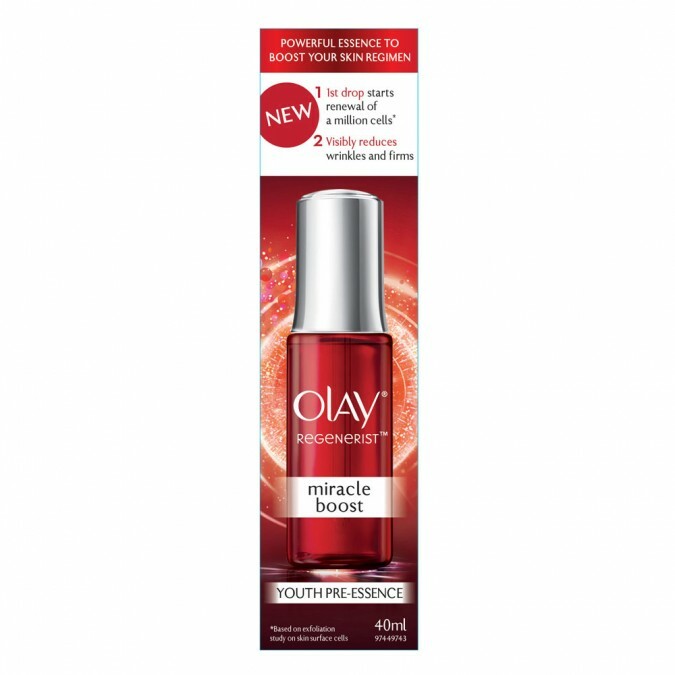 Miracle Boost youth pre-essence from Olay Regenerist. Sheer Light Texture: The product rapidly penetrates into your skin and the key active ingredients work within the epidermis layer. The regimen of Regenerist Miracle Boost youth pre-essence and Regenerist Micro-Sculpting cream provides more active ingredients to penetrate into the skin. Skin Energy Complex: Olay's advanced Skin Energy Complex helps your skin look energised and strengthens skin barrier function to give you healthy-looking skin. Apply product twice a day after toner, and before serum and moisturiser. Un-screw the cap to automatically draw product into drop per. Press the pump button to dispense. Apply product onto the face, avoiding the eye and lip area. For ideal results, apply two pump dosage per use. Water, Niacinamide, Glycerin, Butylene Glycol, Hexylene Glycol, Dimethicone, Acrylates/C10-30 Alkyl Acrylate Crosspolymer, PEG-32, P henoxyethanol, Benzyl Alcohol, Sodium Hydroxide, Methylparaben, Dimethiconol, Disodium EDTA, Inositol, Isopropyl, Isostearate, Sodium Metabisulfite, Tocopheryl Acetate, PEG-100 Sterate, Fragrance, Sodium Ascorbyl Phosphate, Morus Alba Root Extract, Glyceryl Acryla te/Acrylic Acid Copolymer, PVM/MA Copolymer, Sodium PEG-7 Olive Oil Carboxylate, Lilium Candidum Flower Extract, Palmitoyl Pentapeptide-4, Lonicera Japonica (Honeysuckle) Flower Extract. Avoid contact with eyes. Discontinue use if irritation occurs. I do like this product. It is pricey so I waited until it was on sale.